In a previous post I have mentioned a little about how an object might appear when under a single light source and the particular elements that will consistently appear. This is something I teach my beginning students and I have found that sometimes it is helpful to separate each component for easier identification and explanation. Looking at each component or element individually helps in understanding the role of light on form and helps in identifying how everything then ties together. Today, we are going to look at the elements of light and shadow on a simple cylinder to identify each component individually. First we need our form. In this case, it is a simple cylinder. I have painted a cylinder white and placed it against a similar background so that the shadows are easier to see and the eye won't be confused by any of the local color. Let me explain the images. There will be a group of three images for each component discussed. The first will be the reference photo of the cylinder so that we can look for that lighting element on the actual object and in the environment. The second image will be a simplified graphic of the cylinder showing each component as it is added to the cylinder. In this simplified image I have removed any gradation so that it is easier to distinguish the boundaries of each element. The third image in each set will be the same simplified image as the second but highlighting each new component in red. This is to make locating some of the smaller ones easier to find at first glance. When an object is under a single light source you will first notice the separation of a light side and a shadow side of the from. The amount of surface that appears in shadow or in light depends on the position of the light in relationship to the viewer. The area in shadow on the object will be any surface area that recedes behind other parts of the object, yet is still visible to the viewer. This area is always opposite the light source. As you can see in the photograph, the edge of shadow blends into the light side of the cylinder in a gradual transition. This gradation or blended edge is what is often referred to as a soft edge. This just means that the edge of a form shadow blurs into the middle tone on the light side on the cylinder. The cast shadow is the shadow that appears on a surface that another object or form is blocking the light from reaching that surface. In this case, the cylinder is blocking the light from reaching the table behind it. The edges of the cast shadow are much more crisp or clean than those of a form shadow. There is little to no gradation or blurring in the edges here. These types of edges are often called hard edges. As a general guideline just remember, form shadows have softer edges and cast shadows have harder edges. The is generally reflected light bouncing into the shadows, changing the value levels of different areas of those shadows. The reflected light is bouncing off of the surfaces behind the cylinder and is strongest on those areas closest to the to the surface reflecting the light. This will give the form shadow a particular appearance. Near the shadow's edge shadow closest to the light side of the cylinder you will see a darker area running lengthwise up and down the cylinder. That strip of darker shadow is the area where the least amount of reflected light is impacting the shadow. That area is often called the core shadow. One way to think of the core shadow is that it is the area of the shadow that transitions from the reflected light to the light side of the cylinder. That shadow information only explains part of the cylinder. We next need to look at the information found in the light side. Here, it can be divided into two main parts, the middle tone and the light area. The middle tone is the transition in between the form shadow and the lightest part of the light side. The light area is, as the name suggests, the area more effected by the light source than the other areas. Again, on a cylinder the transitions between middle tone and the light area will be a gradual blended transition. The lightest part of any form under a single light source will be the highlight. This is usually a small area that is overwhelmed by the light and is reflecting most of the light back out. I like to think of it as the overexposed area in a photograph. The size, amount, and location of highlights can vary, depending on how reflective the surface of the cylinder is. The more reflective the surface the more powerful the highlight or highlights will be. Since this cylinder is not very reflective there is only a small highlight on the rim of the top of the cylinder. If you can't see it in the photograph look at the bottom image, I have it highlighted there. Reflected light finds its way into the cast shadow as well. The area that is getting more of the reflective light will usually be further from the base of the cast shadow and, as such, you will see that near the base of the cast shadow is darkest. Here I added a simple environment for the cylinder to reside in, just to give a better sense of how it all comes together. I suggest that you test this out and look for the elements of light on your own. 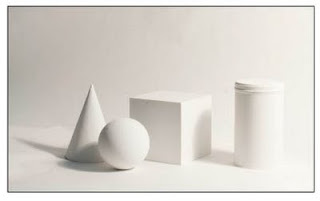 Find an object the shape of a cylinder and paint it white using a flat white house paint. Then aim a directional light at it and look for each element of light described above. It is easy to do. In my example I took a cookie tin and painted it with house paint I got from the local hardware store. I then just set it on a large sheet of paper on my desk and aimed my desk lamp at it.